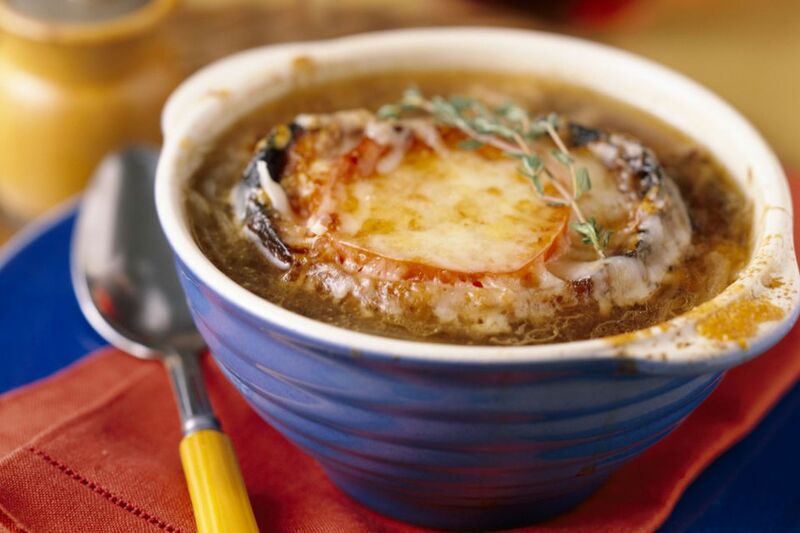 This delicious onion soup is baked and topped with toasted Parmesan bread and Monterey Jack cheese. Sauté onions and garlic in butter in a large Dutch oven or stockpot over low heat, stirring occasionally, until lightly browned and tender. Add beef and chicken broth to the onions. Bring to a boil; reduce heat and simmer for about five minutes to blend flavors. Add sherry and season to taste with salt and pepper. Toast bread slices; sprinkle with Parmesan cheese. Ladle hot soup into four individual ovenproof casseroles. Place two to three slices of toasted bread on top of soup in each. Sprinkle each with Monterey Jack cheese. Bake at 375°F for about 25 minutes, or until soup is bubbly and cheese is lightly browned.